New comic book days was a big deal for Daredevil fans this week! Daredevil #28 came out, along with Indestructible Hulk #10 (the second issue of the two-part story Blind Rage, featuring Daredevil). For now, let’s take a look at the most recent issue of the main title, which saw regular colorist Javíer Rodriguez pull double-duty as both penciller and colorist (ably assisted by inker Alvaro Lopez). In this issue, we see Matt come face to face with one of his childhood tormentors in a story which ends with an unusually shocking cliff-hanger. We also check in with Foggy, who is starting to display visible signs of his disease. His frailty and vulnerability are incredibly tragic to see on the page, even as writer Mark Waid injects these scenes with warmth and humor. The art, which I will have plenty of reason to return to, is absolutely top-notch. Rodriguez’ art style is both distinctive enough to give us an interesting change of pace and similar enough to Chris Samnee’s approach to make everyone feel right at home. Samnee will be back with issue #30, but until then we are in extremely capable hands and I intend to enjoy every panel that Rodriguez treats us with. Daredevil #28 is chock full of absolutely brilliant moments, scenes, and lines of dialogue that simply could not have been written by someone who doesn’t have Mark Waid’s seemingly instinctive and effortless understanding of what makes Matt Murdock tick. Some of these scenes easily rank among my favorite of his run so far. But, I will admit that it took me a couple of reads to fully wrap my head around the nature of the central conflict between Matt and the man who decides to show up at his office in the shape of no-good, former bully Nate Hackett. I think I finally got there, and I will get back to that, but let’s start by working our way through the issue. Since it took me a couple of days to get this review up, I’m going to assume that most of you have read the issue already. There will be spoilers, and you have been warned! The first few pages are one of the real high-notes of this issue. We start with a close-up of Foggy’s fingers holding up a tuft of newly shed hair that is interrupted by Matt sticking his head in the door and trying to cheer his friend up with a joke. I know I’ve said this many times before, but people suggesting that it is out of character for Matt to be cracking wise in any way, shape or form are just dead wrong. Matt Murdock has a great sense of humor, and he pretty much always did, even though it’s been expressed to varying degrees and has often had to take a back seat to the heartbreak he’s frequently gone through. It is often self-deprecating, as seen in this scene, where blind humor (massage therapist is up there with piano-tuner on the list of archetypal “blind jobs”…) gets mixed up with his freely admitting to being something of a ladies’ man. Things get more complicated when it turns out that Foggy’s treatment is also causing a considerable amount of distress for his friend. The smell of the cocktail of drugs going into the chemotherapy is enough to send Matt to the bathroom vomiting, and it is a true testament to his loyalty to Foggy that he is able to steel himself and go back in. This is a great way for Waid to demonstrate not only the depth of the law partners’ friendship, but to remind us of the downside to Matt’s own physiology. The middle chapter of this issue mixes the here and now – specifically a conversation between Matt and would-be client Nate Hackett – with flashbacks to Matt’s childhood. What is interesting about these flashbacks is that they are told from two different perspectives. 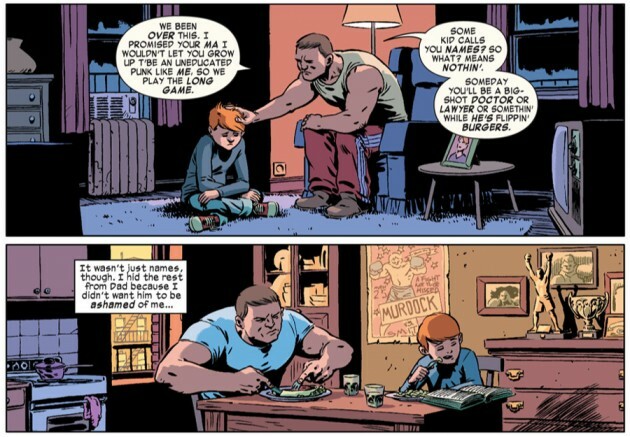 Going into this issue, and this scene specifically, I had some expectations for how the meeting between Matt and his former bully was going to play out. Waid goes down a very different path compared to anything I’d had in mind. This made my first experience reading this issue a rather bumpy ride, and it took an additional reading of the story before I was able to fully appreciate what was really going on, and realize that never knowing what to expect is one of the many things that makes this book great. Rather than paint Nate Hackett as completely unsympathetic, Mark Waid serves us with a much less black and white perspective, and even takes the angelic young Matt down a notch. The flashback scenes shown from Matt’s perspective tell a very familiar story, one we’ve been told before and know very well. It is at the heart of the mythos of how Matt came to be Daredevil. Nate’s version of how things went down is a little different. There’s no denying that he and his lackeys were brutal, but Nate’s memories also show Matt as a know-it-all braggart with a big mouth. And, as Matt admits, there is no sign that Nate is lying about his version of the events. This doesn’t mean that what Nate is telling is the actual truth, but it does mean that it is his truth, and that he believes his own memories and lines of reasoning. This all makes for a very interesting reminder of the fact that we construct our own identities based in large part on the narratives we create for ourselves. Regardless of what really happened in the past, there is no denying Matt’s feelings about Nate in the present. Or to quote the main character himself: “I’m surprised to realize I’m still furious and resentful all these years later.” Matt shows no signs of forgiveness, and I suspect that Nate’s failure to offer up a genuine apology is what further gets on his nerves. It is revealed that after Nate read in the paper about Matt being Daredevil, his sense of guilt over his past behavior – and Matt’s accident – was instantly lifted, since Matt’s life, in Nate’s eyes, had been improved rather than ruined by what happened. Given everything Matt has been through over the years, in and out of his Daredevil costume, he may be less inclined to see things quite the same way. When Nate finally reveals his legal predicament, it is Matt’s sense of justice rather than any real forgiveness which determines his next move. When Matt decides to help Nate, it is the same kind of legal coaching type of assistance that he’s been offering other clients lately, and this makes for a very entertaining final court room scene where Nate repeatedly stumbles yet soldiers on undeterred. Well, until the very final scene which puts an extremely shocking end to this issue, and made my jaw drop in disbelief. If there is anything I might fault this issue with, it’s that maybe the ending is a little too shocking. I am extremely intrigued to see what will happen next issue, just as I am eager to find out even more about who Matt was before he started dressing up in red PJs. Mark Waid is on a fast track to becoming my favorite Daredevil writer. I know it’s considered somewhat controversial to not place Frank Miller on a pedestal and declare his take on the character as the pure essence of “Daredevil-hood,” but doing so feels uninspired to me. The very thought suggests that Daredevil is by definition a character defined more by his past than his present or future, like one of those (rather sad) people who spend their adult lives reminiscing about their years as the star quarter-back in high school, seemingly unable to repeat that level of success. On the contrary, Daredevil is a character with a wide range that seems to be able to bring out the best in his writers. 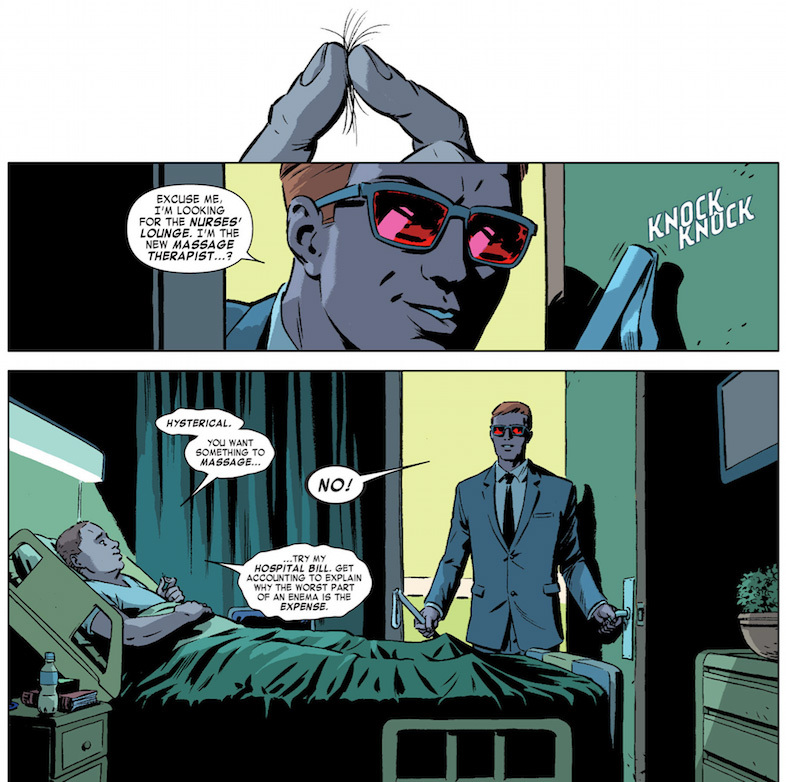 Mark Waid gets Matt Murdock, and I get the sense that he’s truly enjoying the process of getting to know our favorite blind lawyer, taking him out for a spin, putting him in interesting situation and testing his reactions. There is a lot of the latter happening in this issue and I applaud Waid for being as gutsy as he is. I have only briefly mentioned the art so far, but it absolutely deserves its own chapter to this review. Javíer Rodriguez’s work is extremely strong this issue, and far better than anything I could have imagined. It’s not that I had low expectations going in, quite the contrary, but I didn’t expect to fall in love with the look of this issue to the extent that I did. Among the things that impressed me the most were the flashback scenes (young Matt Murdock is so adorable it completely melts my heart), the Nate Hackett character design (just the right amount of unsavory ogre going on), and the superb amount of detail throughout the issue. The “walk-through” scene above, showing Matt in Nate’s apartment is fantastic, as is the creative use of panel layouts in the spread which shows what Daredevil is doing while considering Nate’s case. 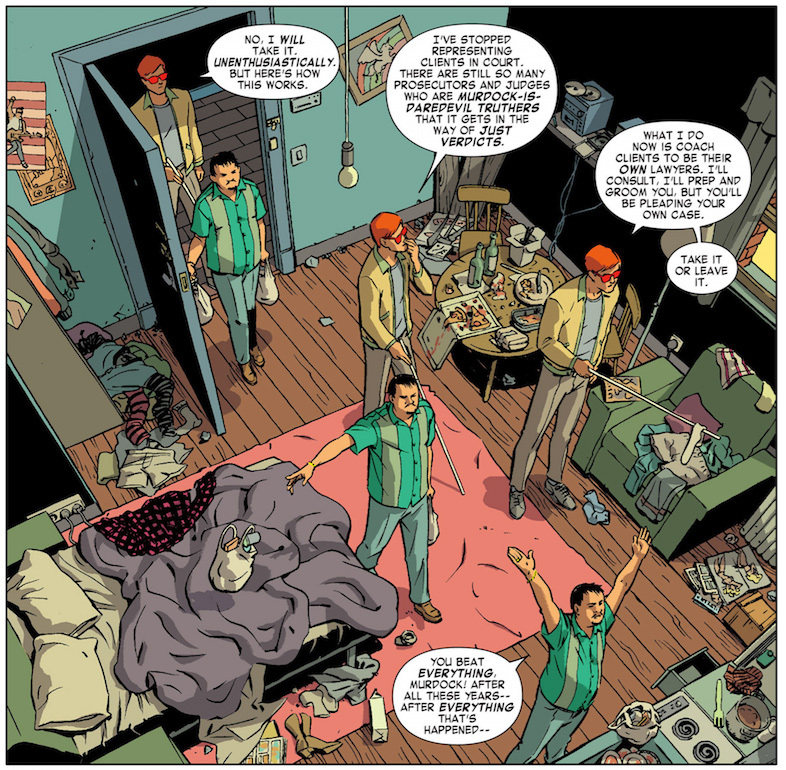 One obvious advantage of having someone already “in the family” provide the pencils for this issue is that Rodriguez already knows what things are supposed to look like in terms of the regular cast of characters, the layout of Matt’s office and the look of Foggy’s hospital room, to mention just a few examples. This means that he can put his own twist on things without confusing the reader needlessly by changing things around that help support a sense of consistency. As much as I love Samnee’s work on this book, I am more than comfortable seeing Rodriguez step in whenever the opportunity presents itself in the future, knowing that he has all the skills to keep the artistic quality of the book up to the standard we’ve become accustomed to. Daredevil fans are spoiled, we all know it. I think I’m going to round things off here. Now I want to hear what you thought. Let the rest of us know in the comment section! I’ve been thinking about that favorite DD writer question too, Christine. I’m a HUGE fan of Frank Miller, not just as a writer, but as an artist as well. The stories crafted with Klaus Jenson are fantastic, and despite the “dark, gritty” label they often get, they really have a lot of fun moments, like the running gag of guys going through the bar window, or Daredevil running along rooftops with a smile, or that delightful Iron Fist/Luke Cage one-shot. Waid run seems like the successor to that, taking an established character and crafting a story that makes it seem like he’s the only one who can write it. I’ve always loved DD, but honestly, I think it took Mark Waid for me to really love Matt Murdock. Us DD fans are blessed to have such talented creators on this book, and I hope Waid and co have many years worth of stories left in them. Your review hits most of the points I would have made, but I do want to emphasize that I love the Nate flashback that shows Matt was kinda a douchebag himself. It doesn’t excuse Nate and the bullies actions, it doesn’t make Matt’s eventual accident less tragic/heroic, but I think it does add an interesting dimension to it. Matt Murdock isn’t infallible, he’s human like the rest of us. Heck, we saw that pretty recently when he didn’t/couldn’t save Bullseye from losing his eyes. He’s not an angel, but we relate to his flaws, love his charms, and root for him anyway because he’s still a good guy. Thanks for weighing in, Jeremy! I agree that Matt is better for his imperfections. In other news: If anyone is interested, the episode of the Fantasticast (mentioned in this post), is now available here. Overall amazing issue. Loved the artwork. Rodriguez almost knocks it out of the park. Almost. My only two problem with the issue both art wise and narratively were the flashbacks, which I agree were really well written with lots of layers. My problem was that I thought the art style made Matt look way too young, which wouldn’t have made much difference if they hadn’t tied it directly to his origin. The panel of him being blinded by the chemicals he looked 4 years old, if that. Minor complaint and far from the first time Matt’s age in an “origin” moment has been questionable. Mr. Waid is a wonderful writer. There is no question of that, but I really wish writers would just leave established character origins alone instead of everyone adding their own little tweaks all the time. Daredevil and Batman seem to suffer the most from this. So now Matt might have been a braggart who was asking to be bullied and the last familiar face he saw was one of his bullies before he saved the old man which caused him to go blind. The old man by the way sexually abused his daughter who would show up in another DD story in another spin on his origin. This isn’t really a narrative problem as I said above as it works and was well told. Just a preference. I almost didn’t mention this but your statements above about DD being defined by his past, in a different way, made this stand out in my mind. This is a story rooted in perception. Nate’s recollection is that Matt was something of a braggart and his resentment towards that lead him and others to bully Matt. Now Matt may not believe he acted either in such a fashion or to that degree as Nate implies. It’s a psychological truism though that what we think about other people’s perception of our own behaviour can influence or change that behaviour. For example, Matt may act cocky. He doesn’t think himself as cocky though. But someone points out, “Hey, Matt, you sure are acting cocky”. Now he considers what behaviour of his may lead this person to think that he is cocky. Upon that self-examination, he could either amend his behaviour if he doesn’t want to viewed as cocky or he could revel in it since he thinks that person is right. It’s obvious though that Matt believes Nate is exaggerating the past, trying to excuse his own past and mistakes by somehow relating it all to Matt’s turbulent life. Either way, Waid offers up an interesting look into Matt’s past. As for tweaking the origin, I applaud it. A good writer takes what has gone before and expands on it without changing the core of it. Running from bullies that lead to his walking across the street that lead to him saving the blind man that lead to his accident? A good addition to a classic moment. The ending was shocking. But does anyone know the issue numbers of his encounter with the Sons of Serpents that was shown in flashback? Or was it even in his book? Looked like the Defenders hanging there. The panel with the Sons of the Serpent is an homage to the cover of Defenders # 24, June 1975. I don’t know why it took me so long to read this, but I just finished it. I found the ending to the issue pretty odd for some reason I can’t place my finger on. Waid is becoming one of my favorite DD writers, too. I do have much love for Frank Miller. Bendis also has a special place in my heart because I started reading during his run.